Rule #1: Do not cook brown rice the same as white rice. If you do, you’ll get one of the most unpleasant textures imaginable. Instead, treat brown rice like pasta–boil the grains in lots of water, then drain it, and you’ll get a dish you may enjoy eating. 1. Bring the water to boil in a 3 quart or larger pot. Turn off heat, pour rice in. Stir. 2. Turn heat back on, return to a boil, with no lid. Boil at medium-high heat for 30 to 35 minutes. Turn off heat. 3. Drain with a sieve, or strainer, return rice to warm pot to steam for 10 more minutes. For more taste, boil 6 cups of water, add 1 can of Swanson’s chicken broth, return to a boil, and turn off the heat before adding the rice (otherwise it may boil over). Follow the same times and draining technique above. 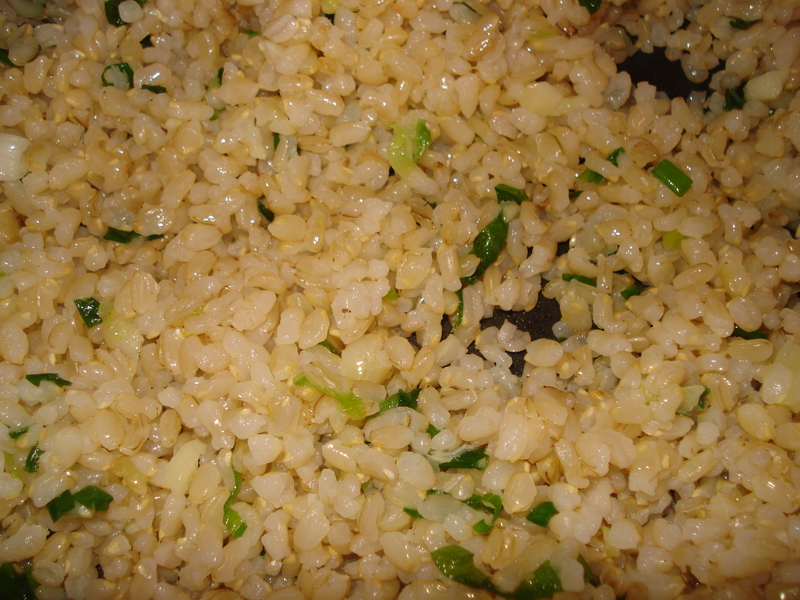 For even more taste, heat 2 teaspoons of oil on medium heat, sauté 1 clove of garlic (minced or crushed) and 1 scallion (sliced) for 2 minutes, add cooked brown rice, and sauté for 3 or 4 minutes. Add 2 teaspoons of soy sauce and stir it in. If necessary, add more soy sauce (1 teaspoon at a time) until it tastes the way you like it. This will taste like pretty good fried rice. For a flavor spike, add very small amounts of Sriracha sauce.